These days, nothing can really earn the label 'miniature' until it can be strapped onto your wrist. 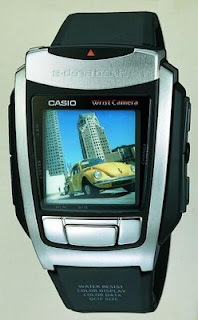 In terms of the digital camera, Casio achieved this feat with the release of the world's first wrist-watch in June 2000: the WQV-1 - a wrist-worn device capable of taking 120 x 120 greyscale images and transferring them to PC via an infrared link. The increasing sophistication of Casio's watch-cameras has now culminated in the new WQV-10, a wrist-camera with an onboard colour screen that takes 176 x 144 JPEG images and includes 2X digital zoom. The 20 x 20mm, 4,096 colour LCD screen, which also acts as a viewfinder, utilises a 25,344-pixel CMOS sensor which can produce images of 16.77 million colours when transferred to PC. You can also view and manage your photos immediately after they are taken and the WQV-10 has enough memory to store 100 images at a time. As in the original model, data transfer is by infrared link to PC, laptop or PDA, at a maximum rate of 115kbps. A USB adaptor is provided if your computer doesn't have an infrared input along with related driver and imaging editing software. The WQV-10 can also exchange photos with other watches in the family (excluding the early WQV-1/WQV-2 models) and the infrared transfer will operate at a range of up to 10cm. The camera functions themselves include three presets for outdoor, dusk and indoor photography, automatic electronic shutter speeds from 1/5.5 to 1/1,660 second and a focussing range of 30cm to infinity. The WQV-10 will work in surprisingly low light - producing serviceable pics but not its best - and the scrolling interface that enables you to view, delete, adjust the contrast or name photos using up to 24 characters per image. Of course the device also operates as a normal digital watch with time/date screen, full-month calendar, 5 alarms, a stopwatch function and a choice of four colour schemes, and amazingly, given the uptime of many 'full size' digital cameras, the battery lasts for 6 months under normal use due to a power saving design enables the watch to shut down and conserve energy when not in use. When we first used the WQV-10 the temptation was to remove it from the wrist in order to get the best angle on a subject, but with practice the need to do this decreased and the desired pics could be obtained easily - even surreptitiously - without un-strapping it. The interface is quite simple with the main 'record' button in an obvious and easily accessible position on the face of the unit and once mastered the watch produces great little snap-shots, the closer you are the better the result. And yes, being only about the size of a standard dive watch, the WQV-10 is one for the voyeurs and Magnum PI's of this world, as well as being a very handy way to ensure that you capture the moment during day-to-day life.